Since my retirement from the California State University system, I have enjoyed teaching online at several universities. My field is literacy and I am a teacher educator, but I have always been interested in the intersection of literacy and technology. Thus my students, usually practicing teachers who are returning to the university for advanced degrees and meaningful professional development are usually eager to learn about new “tools of the trade,” especially for use their K-12 classrooms. In the online teaching environment it is relatively easy to answer that, as teachers (and teacher educators) must learn to use some new tools in order to participate in online coursework. But I would argue that we need to be both savvy and strategic about the tools we require them to learn. It is not new, but I like to use the TPACK model in my planning (Mishra & Koehler, 2006) as shown in the figure below. The TPACK framework or model suggests that three elements must be considered in planning instruction: content knowledge, pedagogical knowledge, and technological knowledge. Where the three intersect may be referred to as the “sweet spot” of TPACK and where we should direct our attention when we plan instruction. I’d like to give an example of this from my own work. I have taught research methods for many years, originally in the brick and mortar environment of Washington State University, where teacher candidates did action research for their certification and MA degrees. I taught it for almost a decade at SDSU, and recently I have been teaching it online for two other universities. Content Knowledge: Teachers need to know about research paradigms and how action research fits into their practice. They need to know how to frame a research question, how to do a literature review, collect and analyze data and how to present and discuss their findings. Pedagogical Knowledge: As the instructor, I need to engage these teachers in both learning and applying their new knowledge. The key is engagement. I can lecture, using a PowerPoint presentation (and I do some of that), but I want them to think and interact with others over the content. Technological Knowledge: I want to find a tool that is relatively simple to learn and use that will provide my teachers with something “new” and useful to them beyond their own immediate learning (hopefully, something they will use for their K-12 students). 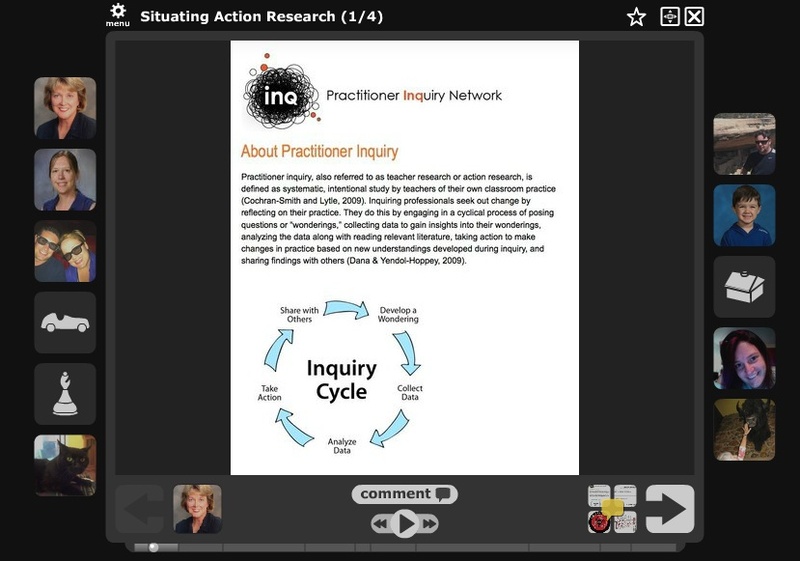 In my research classes, then, I have used another fairly well-known tool called Voicethread to provide an opportunity for my teachers to think and respond to what they have read about action research and use a visual to prompt their reflections. I created a 4-page Voicethread and provided audio directions for responding to each page. Then I suggested my students should respond to the prompt via audio, which they did. The following screen capture shows the initial page of the Voicethread and if you follow the link below, you can view the page itself. Students responded thoughtfully and appeared to enjoy the process from the feedback I received. Several of them also talked about using Voicethread in their classrooms (the Voicethreads can be kept private) with their K-12 students. Their action research projects also seemed to reflect a deeper understanding of the purposes of action research and evidence-based instruction. In the same classes, I asked students to prepare Glogs and Prezis to summarize their research reports and have been really pleased with the results. I’m grateful that I have the TPACK model to remind me that technological tools have to be used meaningfully. 1) Work collaboratively within the university to distribute technological use across the teacher preparation programs instead of relying on stand-alone “Ed Tech” courses. 2) Seek workshops on technology use for themselves and to learn at least one new tool each academic year to apply to their own teaching. 3) Where possible, seek student teaching placements for teacher candidates in classrooms and schools where technology is being used productively. Grisham, D. L. & Wolsey, T.D. (2006). Recentering the middle school classroom as a vibrant learning community: Students, literacy, and technology intersect. Journal of Adult and Adolescent Literacy, 49, (8), 648-660. Wolsey, T. D. & Grisham, D.L. (2012). Transforming writing instruction in the Digital age: Techniques for Grades 5-12. New York: Guilford. It has been 15 years since Eisner eloquently reminded us that we are moving from a text-based world to a multimodal one where we learn to learn from a fresh variety of sources and communicate generatively with a vast array of tools at our disposal. Schools around the U.S. have not always been quick to adopt such new tools and in some cases have moved to discourage the use of new literacies and evolving technologies in the classroom. In other places, such technological innovation is not only welcomed, but also supported. We find a welcome case of such support in Napa, California, where a non-profit institution, NapaLearns (napalearns.org) has become a benefactor of technological innovation, providing grants to schools in the area for the purchase of tools and training. You may learn a great deal about the efforts of NapaLearns by visiting their website. Here I would like to highlight one of the projects that NapaLearns funded. The project takes place in a public school and in the Kindergarten classroom of a very talented teacher, Ms. Martha McCoy. Martha and I became acquainted through her graduate program in Innovative Education at Touro University, where I taught research methods last spring. This year our kindergartners embarked on a great journey to explore the ways technology can be used to enhance their learning. In addition to crayons, paper, pencils, playdough, puppets, puzzles, play, manipulatives, and realia, we are learning with iPads. Our students are primarily English Language Learners, 100% of whom are living in poverty based on qualifying for free or reduced lunch. Less than 2% of the students’ parents graduated from high school in the U.S. and 17/18 students only speak Spanish at home. These students are at the greatest risk of school failure. The strategy for use of the iPads was to provide early academic intervention focused on building English language vocabulary and school readiness in our most ‘at risk’ students. The iPad enhanced kindergarten project began as a partnership between NapaLearns, a nonprofit organization, Calistoga Family Center, a family resource center, and Calistoga Joint Unified School District. The partners share in NapaLearn’s mission to “re-imagine learning for all children in Napa Valley …to promote implementation of education innovation and promote student- centered 21st century learning…so our students can compete in a fast paced technology enhanced world.” (NapaLearns Mission Statement, 2010). Martha completed an action research report to ascertain the effects of a partnership in her school between her kindergarteners (who knew iPads) and 6th graders at the school (who knew about writing). The Kinders and the 6th graders worked in cooperative pairs to create comic strip posters to show preschool children (who would be in K the next year) what a typical day in Kindergarten looks like. The Kindergarteners used their iPad cameras to take pictures of typical scenes in a Kindergarten day. 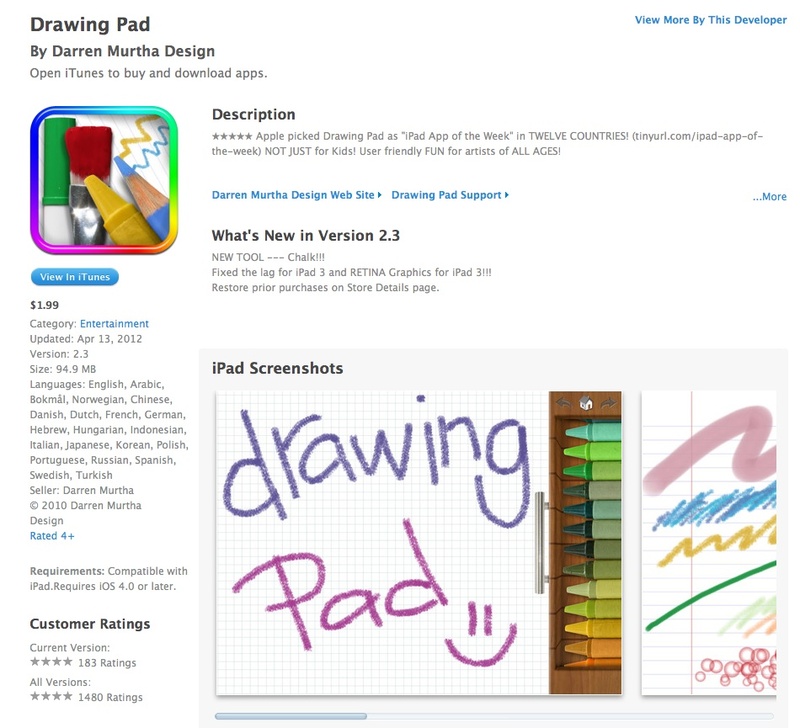 They also drew pictures using Drawing Pad (see screen capture below). The drawing pad application costs $1.99 and I purchased it to try it out. Don’t laugh (I’m not an artist! ), but learning the program was simple and here is a terrible example. 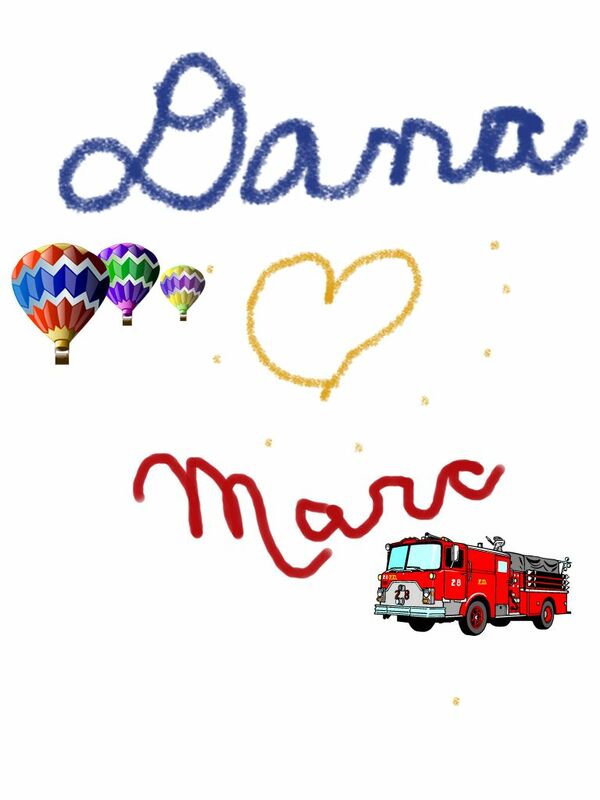 For those of you who know my husband, Marc, he is well represented by a firetruck (we own one from 1949). Me, I’m always up in the air. 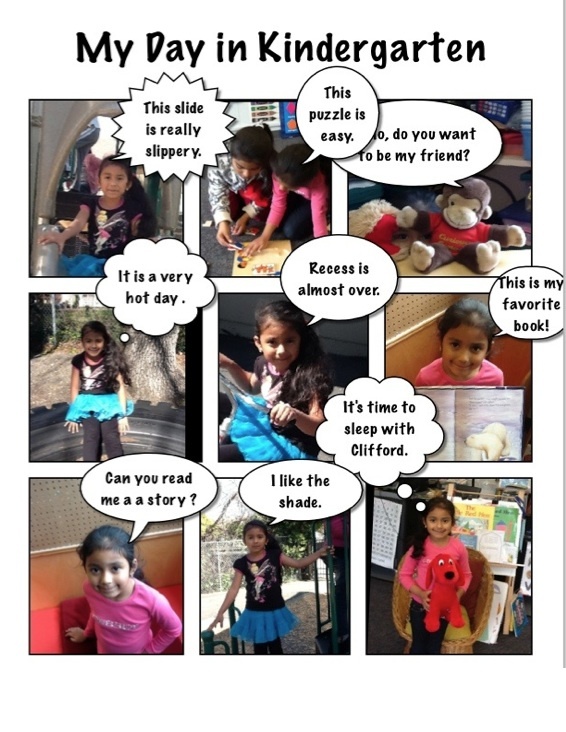 The students put this photos and text together using another iPad (and iPhone) application called Strip Designer (see screen capture below). This program costs $2.99 and I also downloaded and tried it out using photos. But probably the best way to get the essence of Martha’s work is to view her Animoto on the project, also created for the Innovative Learning program at Touro (under the auspices of Program Director, Dr. Pamela Redmond). You can view this at http://animoto.com/play/xLgpKJU7wrQjLe1qaVfWuQ. One project is complete, but new learning continues. Martha is busy planning new efforts for this academic year. She has already designed lessons on digital citizenship for the K-6 team. She plans for 6th graders to learn about Internet safety, cyberbullying, and respectful (and responsible) digital behavior to prepare for teaching their Kindergarten buddies. Then they will design posters, digital books, and skits with their Kindergarten buddies about how to be safe and respectful online. Martha plans to weave elements of Internet safety throughout their projects all year long and build it into their rubrics. I can hardly wait to see the results! In the meantime, I am planning a little research of my own with the collaboration of four high school teachers who will use Strip Designer to scaffold the literature they will be using in their classrooms. Much more on that later. There are so many ways that the above two inexpensive programs can be used to scaffold our students’ learning. The Drawing Pad art can be emailed and archived, as well as placed in “albums” and books to be viewed online or printed out. Strip Designer is very productive also. I have written before with colleagues on the uses of graphic novels in special education (Smetana, Odelson, Burns, & Grisham, 2009; Smetana & Grisham, 2011), while having used them with mainstream classes. 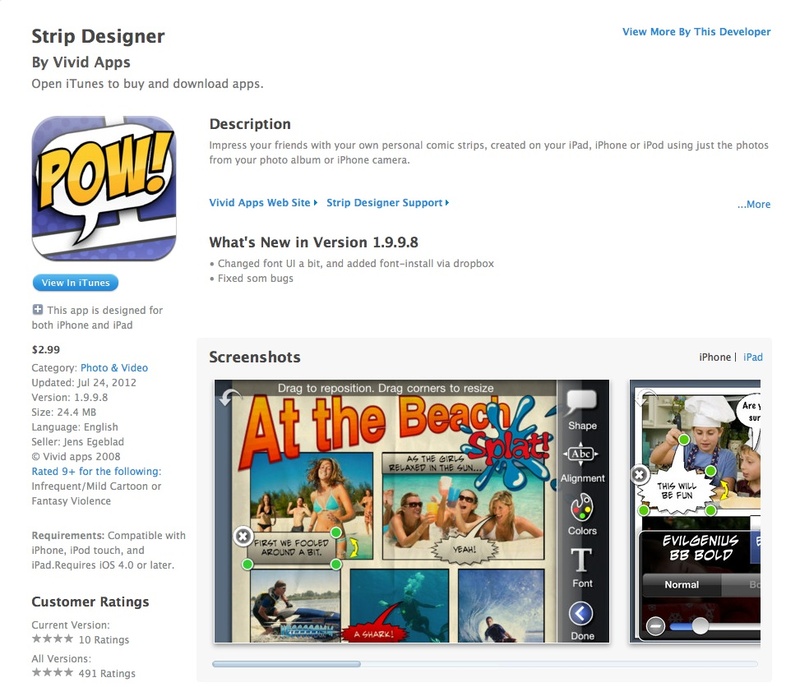 Storyboarding and graphic novel writing is made easy with Strip Designer. There must be many more uses of this that readers of this blog can envision! A very positive part of this is that one iPad can be used to do all of this. Martha has iPads for all her students, but even if you have one in your classroom, you can provide enormous benefits to your students with very little expenditure. What are YOUR ideas for using these new tools? All ideas and comments are very welcome! Eisner, E. (1997). Cognition and representation: A way to pursue the American Dream? Phi Delta Kappan, 78, 349-353. Smetana, L., Odelson, D., Burns, H. & Grisham, D.L. (2009). Using graphic novels in the high school classroom: Engaging Deaf students with a new genre. Journal of Adult and Adolescent Literacy, 53, 3, 228-240. Smetana, L. & Grisham, D.L. (2011). Revitalizing Tier 2 interventions with graphic novels. Reading Horizons, 51, 3.